Planning before sleeping at night that which sabji(curry) to make for next day’s lunch? I have a solution for that – easy, quick, super healthy and again with a new vegetable recipe. 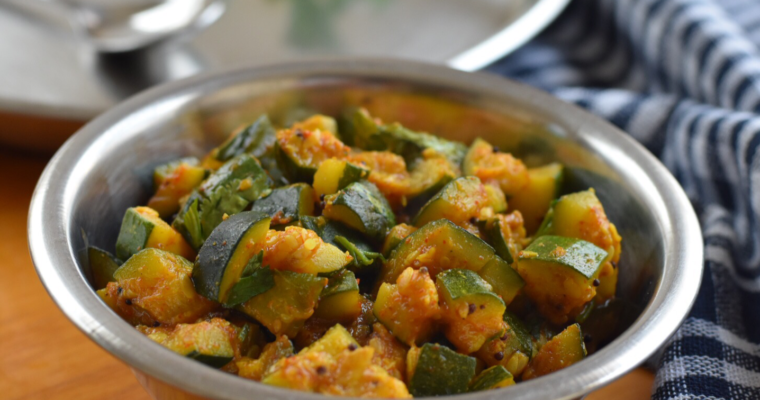 Indian style stir fried zucchini is the best way to use zucchini into everyday menu of Indian kitchen. Zucchini(courgette) looks like it belongs to the family of cucumber, bottle gourd(dudhi) or silk gourd(galka). This green and medium thin vegetable (according to culinary context) is a bunch of benefits, which is well known to reduce weight, yet still boosting the nutrient value of your diet. Great for maintaining eye, heart and overall good health. Check for more about zucchini and its health values here. That’s what it looks like! If you are a weight watcher than you might have heard about zoodles(zucchini noodles). Nowadays veggie noodles are hot trend to avoid gluten to your diet. 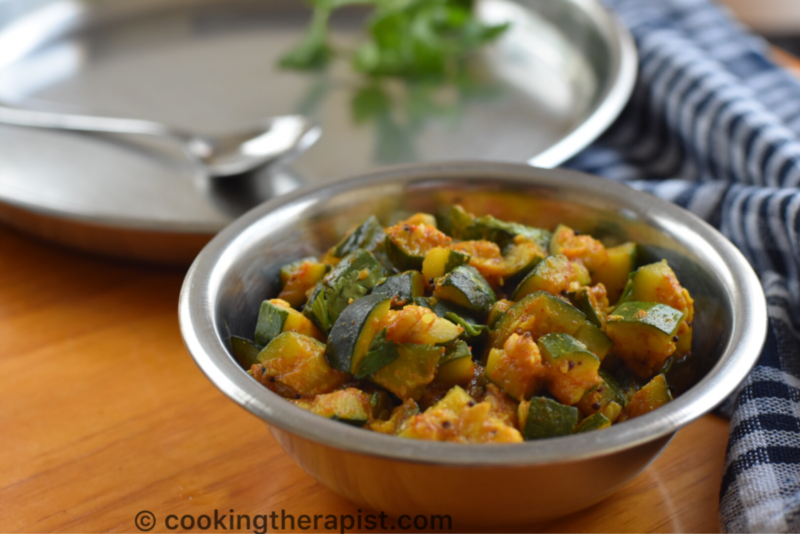 Zucchini is not much used in indian kitchen and curries are Indians everyday need, hence thought of making zucchini sabji(curry). Now you have one more vegetable for making your lunch interesting. Serve it with roti or rice and enjoy this dish of extremely low calories. I would love to hear your feedback. Check more quick and easy healthy, low calorie and almost zero oil Indian traditional recipes. 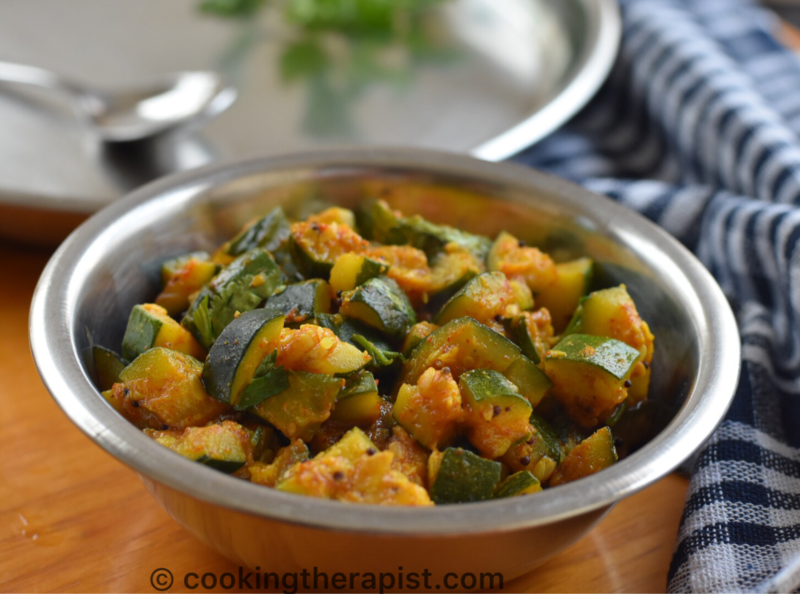 Very easy and quick zucchini curry flavored with indian spices for everyday meal. Zucchini - 3 medium size diced into cubes. Wash zucchinis properly and chop it into cubes. 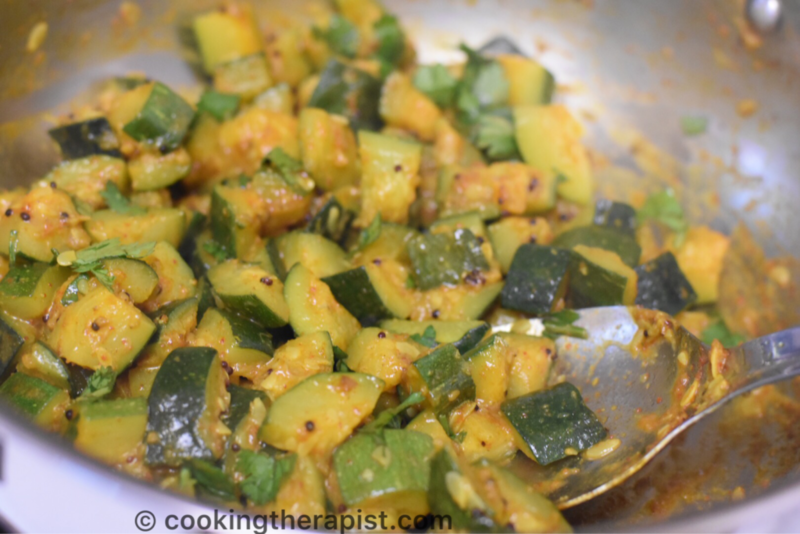 Add asafoetida, turmeric, diced zucchinis and salt to taste. Mix it well. Finally add garam masala and serve it with Chapati (Roti), pack it in the lunchbox or make it for sides. Peanuts are optional if you have it on hand then add it rather than its fine. Skip it if you are allergic to nuts. Always buy fresh, young, slick, smooth and bright colored zucchini. Store for maximum of three days in a freeze with a plastic wrap. Check before cooking it, some of them might be bitter in the taste. 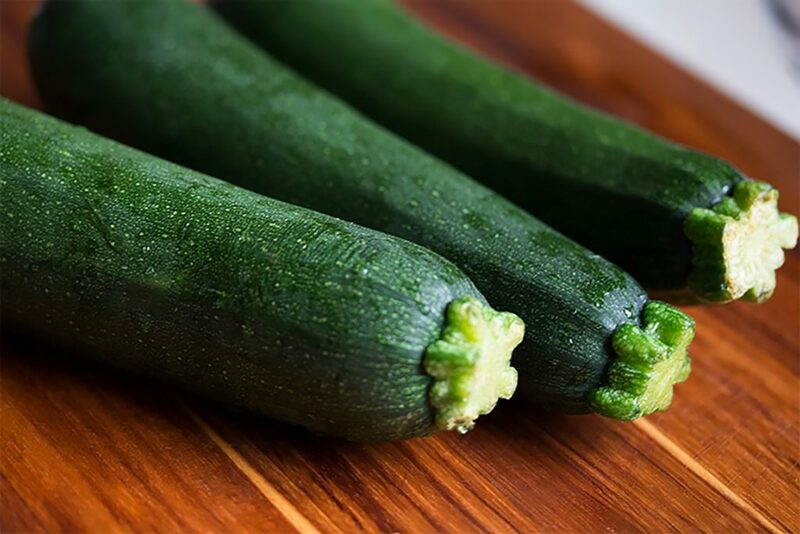 Zucchini contains 95% of water hence no need to add water while cooking, cook it on low flame and add salt just after adding zucchinis. I made this recently but I couldn’t see where or when to add the garlic. I added with the second round of spices. No idea what cumin coriander powder is. I put 1/2 teaspoon each of ground cumin and ground coriander. 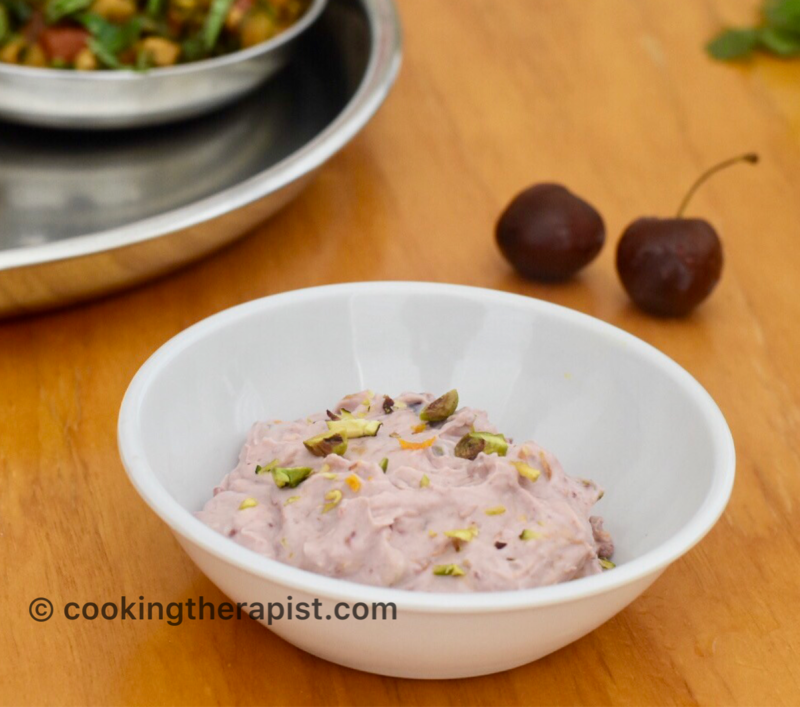 I used ghee instead of oil and cashews instead of peanuts as that’s what I had. I also added what was left of a can of diced tomato. Quite a tasty dish.